Two damaged train cars sit on flatbed trailers after being taken from the scene of an Amtrak train crash in DuPont, Washington, Dec. 19, 2017. Engineers are using cranes to lift the locomotive and cars of an Amtrak passenger train that derailed over a busy highway near Seattle, Washington, killing three and injuring 100. The cranes will lower the damaged cars on the back of trucks and take them to what police call a safe and secure facility for the investigation. Some of the cars fell from the tracks and onto vehicles traveling Interstate 5 — a major West Coast highway running from the Canadian to the Mexican border. Another train car was left dangling from the bridge over the highway. Federal investigators have recovered one of two data recorders and are questioning the crew regarding the accident, which occurred during the Monday morning rush hour. 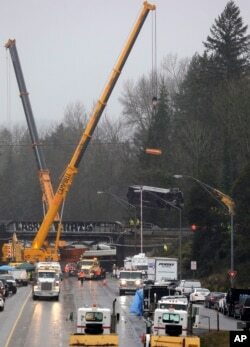 A crane is used to lower a damaged Amtrak train car from an overpass at the scene of Monday's deadly train crash onto Interstate 5 in DuPont, Washington, Dec. 19, 2017. They already know the train was traveling at 129 kilometers per hour on a stretch of track with a speed limit of 48 kilometers per hour. However, investigators do not know why the train was traveling so fast. One federal official says the engineer may have been distracted by an employee-in-training in the locomotive. Washington state transportation officials say a safety system that slows or stops a speeding train had been installed on this stretch of track but was not yet ready to use. This was the initial passenger run for the Cascades 501, which provides service between Seattle and Portland, Oregon. The line primarily served slow-moving freight trains before the track was upgraded for higher-speed passenger service that cut about 15 minutes off a one-way trip. Mayor Don Anderson of Lakewood, Washington — a city near the crash site — said the city fought against the new Amtrak line. He said it was a costly project that provided little transportation benefit, while creating a risk to pedestrians and vehicle traffic by mixing roads and train crossings. "We politically and legally took whatever action we could to either stop it or provide for additional safety modifications," Anderson said. The mayor called Monday's accident "a tragedy for all concerned." President Donald Trump sent his condolences to the victims of the train crash and said, "It is all the more reason why we must start immediately fixing the infrastructure of the United States." Congress ordered the nation's railroads implement speed controls after a series of accidents. The legislation calls for the safety upgrades to be completed by the end of 2018, after the railroads won a three-year delay from the original 2015 deadline. In May 2015, an Amtrak train derailed in Philadelphia as it went into a curve at more than double the posted speed limit. Eight people died in that accident, which investigators blamed on the engineer being distracted by radio conversations between trains and dispatchers about trains being hit by rocks. Lori Lundin contributed to this report.